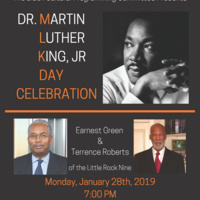 The Black Cultural Programming Committee is hosting the Dr. Martin Luther King, Jr. Day Celebration on Monday, January 28, 2019. Join us to experience Earnest Green and Terrence Roberts of the Little Rock Nine, at 7:00 p.m., in the Alumni Memorial Building, Room 210. Really insipring and entertaining for all audiences. A must see.